Singapore, which had been one of the Straits Settlements since 1826, became a separate Crown colony in 1946. 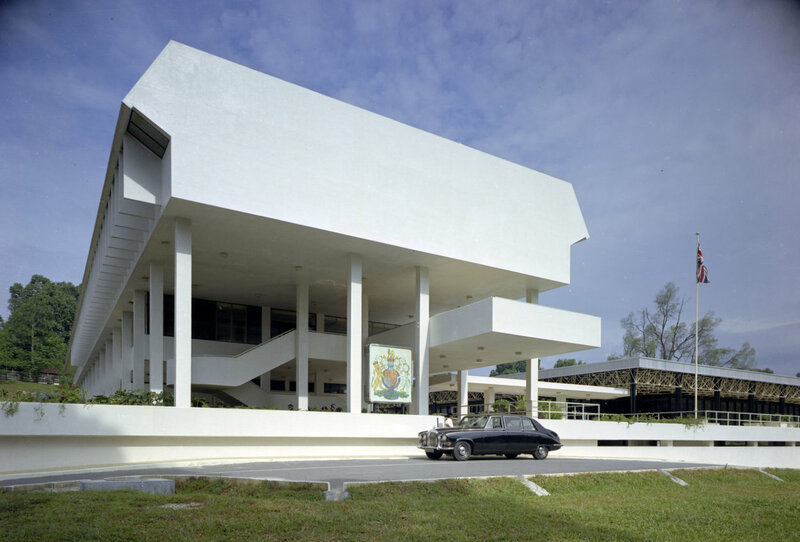 It was granted internal self-government in 1959 and joined the Federation of Malaysia upon its creation in 1963. It left the federation two years later to become an independent republic within the Commonwealth. Britain’s residual military presence was withdrawn in 1971. When civil government was restored in Singapore in March 1946, the Colonial Office appointed Lord Killearn as special commissioner in south-east Asia. He and his staff shared the requisitioned Cathay Building, Singapore’s tallest building at nine floors, with most of the other British civil entities in Singapore: the hundred or so British staff were using requisitioned houses as hostels . Requisition regulations were due to expire at the end of 1948 and the Chinese family that owned the Cathay Building refused to agree a lease for thereafter. Since the British staff was expected soon to increase to two hundred, there was an urgent need to prepare accommodation for the future. A forty-acre site at Braddell Rise, bought from Crédit Foncier d’Extrême-Orient, was laid out with extensive semi-permanent hostels and blocks of flats by the architectural firm Palmer and Turner, and eleven houses were bought and repaired on Holland Road. The Ministry of Works, dealing for the first time in their experience with the Colonial Office, was anxious about all this expenditure and sent a Mr Douglas from its Shanghai Office to have a look: he gave these residential proposals a clean bill of health. 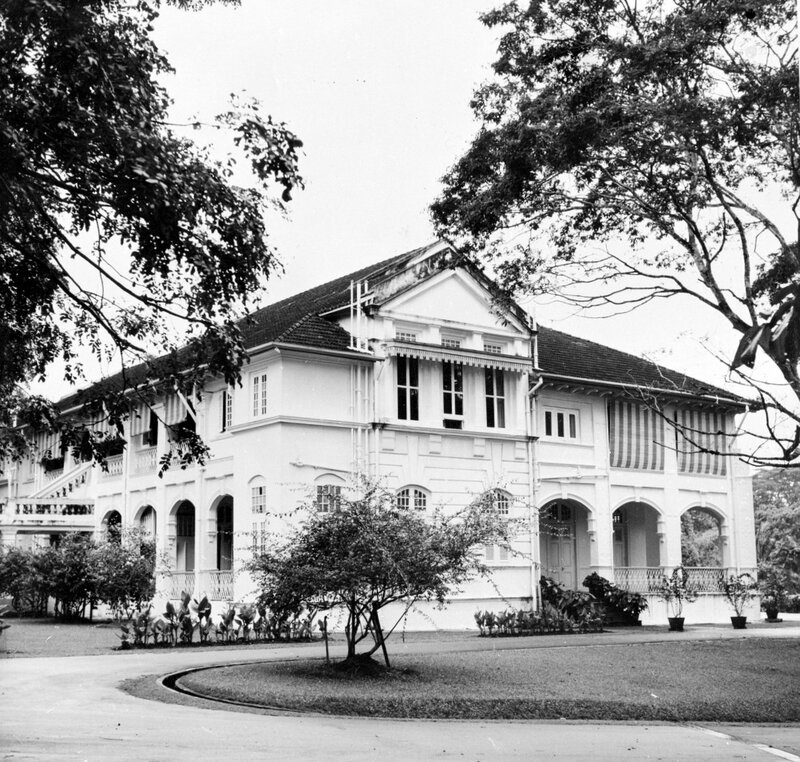 Fourteen acres at Kay Siang Camp, later referred to as Phoenix Park, on Tanglin Road was acquired for the future offices. 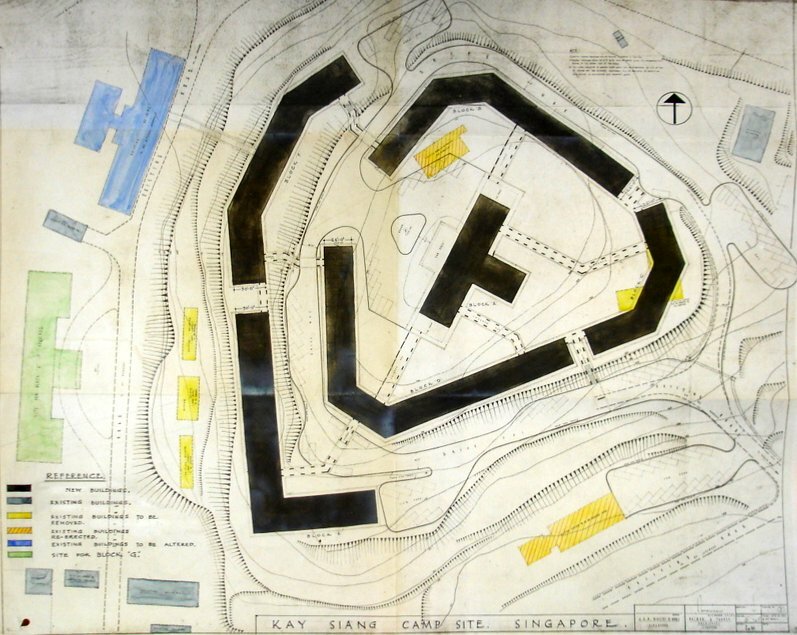 The Singapore government agreed to lease this land on condition that it could build and maintain the accommodation, all of which was again semi-permanent and laid out by Palmer and Turner, and take the site over when no longer required by the British. The staff numbers rose to 250 during 1947. The British vacated Phoenix Park in the early 1970s: it was designated a Historic Site in 2012 by the Ministry of Home Affairs and the National Heritage Board. Phoenix Park became the main high commission offices at independence. 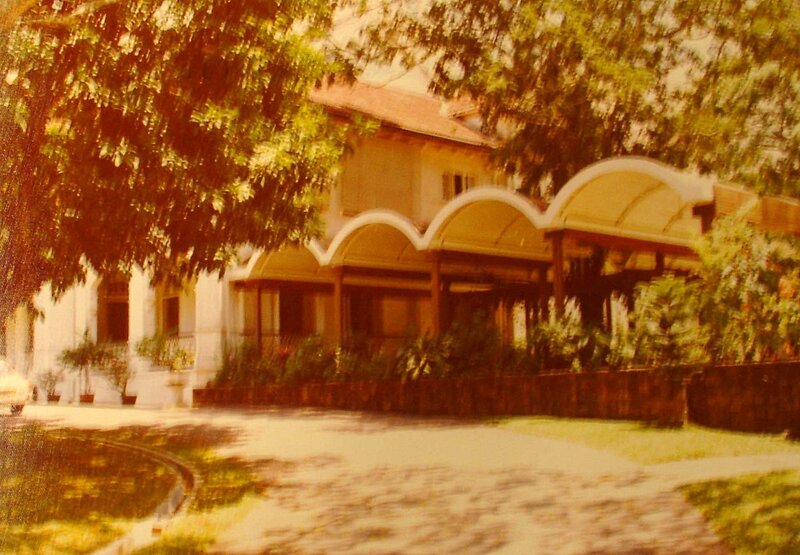 With the planned departure of British forces from Singapore in 1971, there was an urgent need to acquire new high commission offices and staff accommodation. 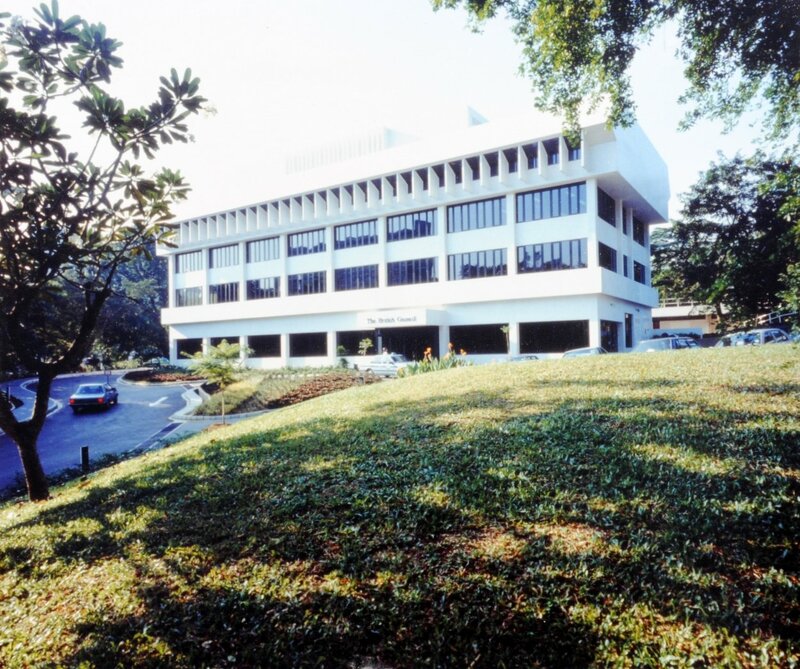 A good site on which to build offices was identified on Tanglin Road at Lots 1131-2, Mukim No.2, and made available by the government of Singapore as a Statutory Land Grant specifically for this purpose. If ever the site was no longer required for this purpose, it was to be surrendered to the government, who would pay in compensation a sum representing the depreciated value of the buildings. The site, which included 3 and 4 Ritchie Road to the rear, comprised three hectares: it was a condition of the grant that the third of the site closest to Tanglin Circus should be a landscaped area. The transaction was completed in August 1972. 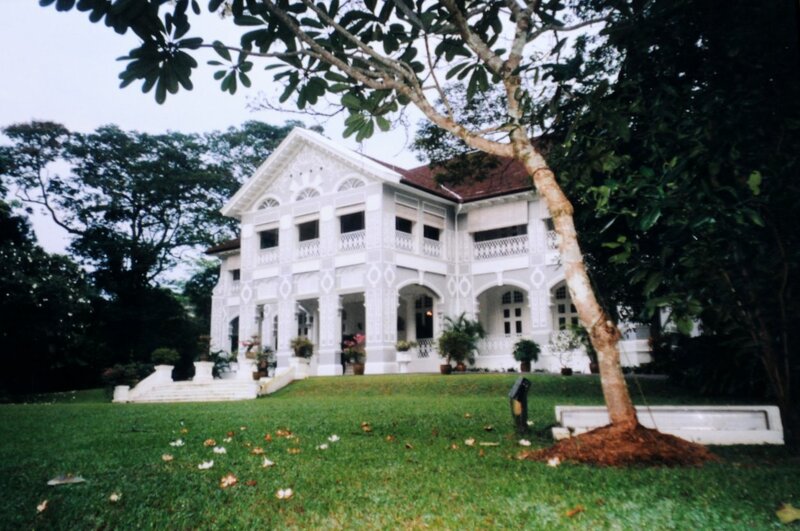 In November 1985, a supplemental deed to the Statutory Land Grant was agreed to enable an ‘extension … to be erected for the use of the British Council on condition that the Singapore Government may, at any time, by giving 12 months’ notice, terminate the use of the extension to be erected by the British Council’. The Council duly completed a building containing its offices and twenty or so classrooms in 1988: Raglan Squire and Partners were the architects, working within a development plan and elevational treatment agreed with the Foreign Office to ensure the compatibility of all the buildings on the site. Palmer and Turner plan of staff residential accommodation at Phoenix Park, 1946. 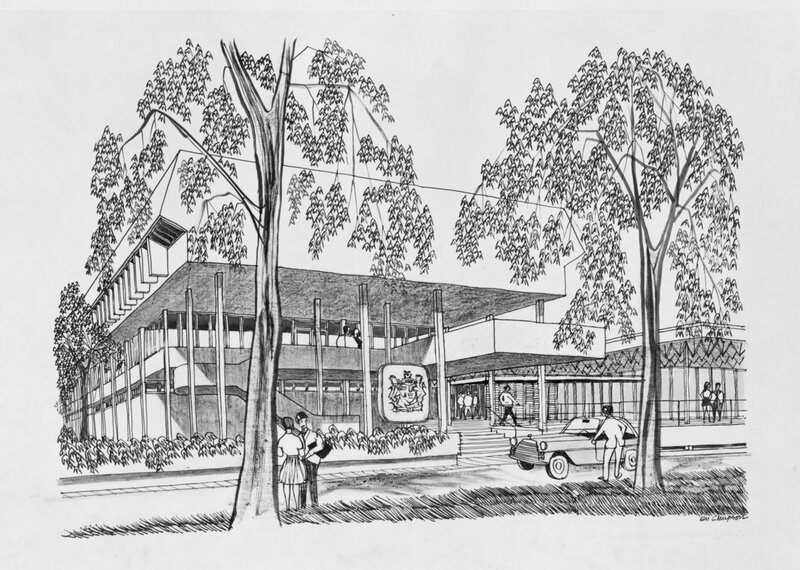 Sketch by Ken Campbell of entrance to proposed new offices, 1970. Offices, viewed from pavilion podium, 1973. Eden Hall, at 28 Nassim Road (originally designated No. 7), was bought freehold in 1955 for £55,000 as the residence of the Commissioner-General, by then Britain’s senior representative in Singapore. The five acre site, part of the former large Lady Hill estate, was originally acquired in 1903 by Saul Nathan. He permitted his partner, Ezekiel Manasseh, to build a fine house on the site in 1904 and sold the site to him in 1912. 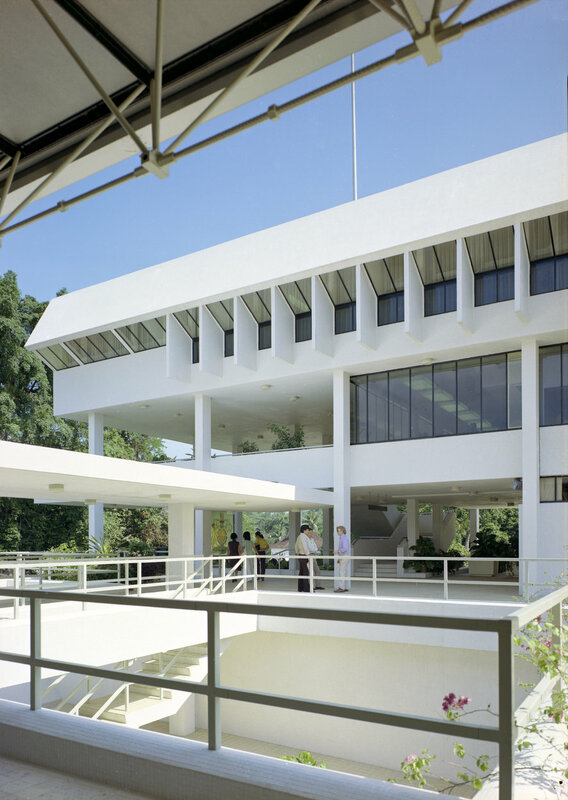 The architect was RAJ Bidwell of Swan and MacLaren, Singapore’s leading architect of the period. Manasseh called his new house Eden Hall, likening it to the goblet, in Longfellow’s The Luck of Edenhall, upon which the fate of the family depended. Manasseh leased Eden Hall to a Mrs Campbell, who ran it as a ‘boarding house for bachelors’, until he took up residence himself in 1916 upon his marriage to an English widow, Elsie Trilby Bath, who had two children of her own. 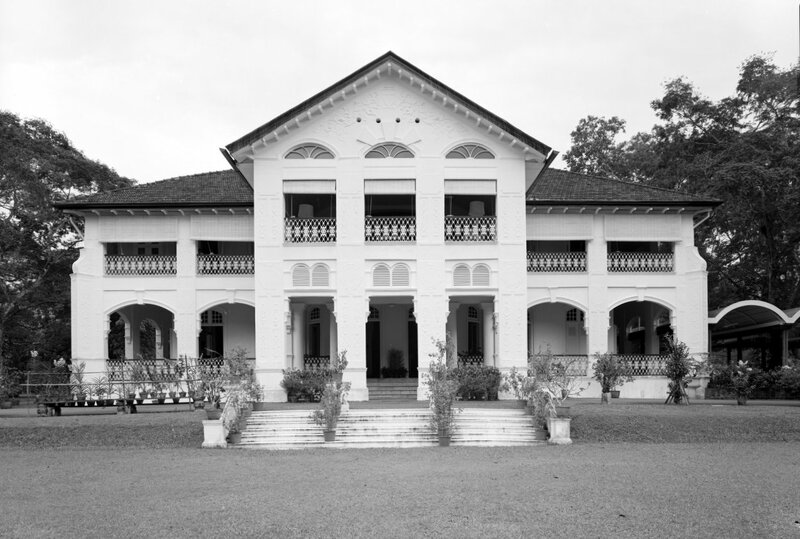 During the Second World War, Eden Hall was commandeered by the Japanese Occupation Forces for an officers’ mess: they apparently treated it better than the British forces who succeeded them. Manasseh’s stepson, Vivian Culienen Bath, regained possession of the house after the war and sold it to the Ministry of Works in October 1955 when he retired to Australia to the Ministry of Works for £55,000 as the residence of the Commissioner-General, then Britain’s senior representative in Singapore. Bath insisted that a plaque should be installed at the foot of the flagpole with the inscription “May the Union Jack fly here forever”. 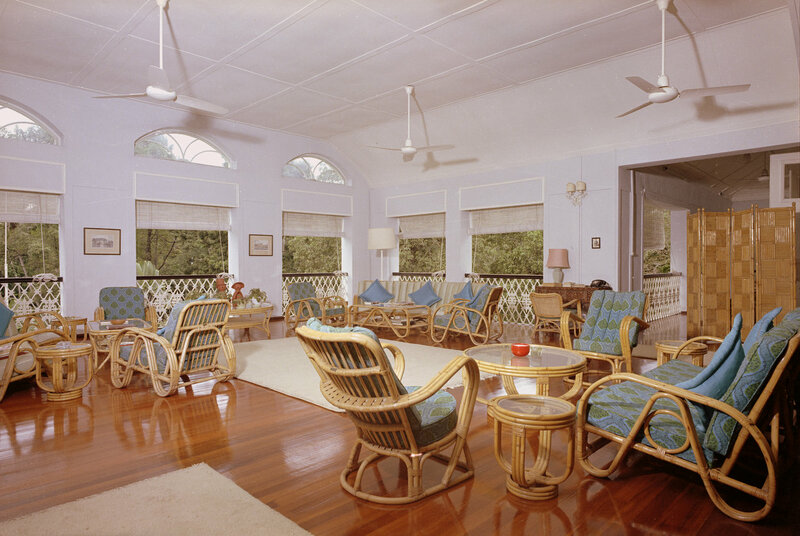 Eden Hall became the high commissioner’s residence in 1959. 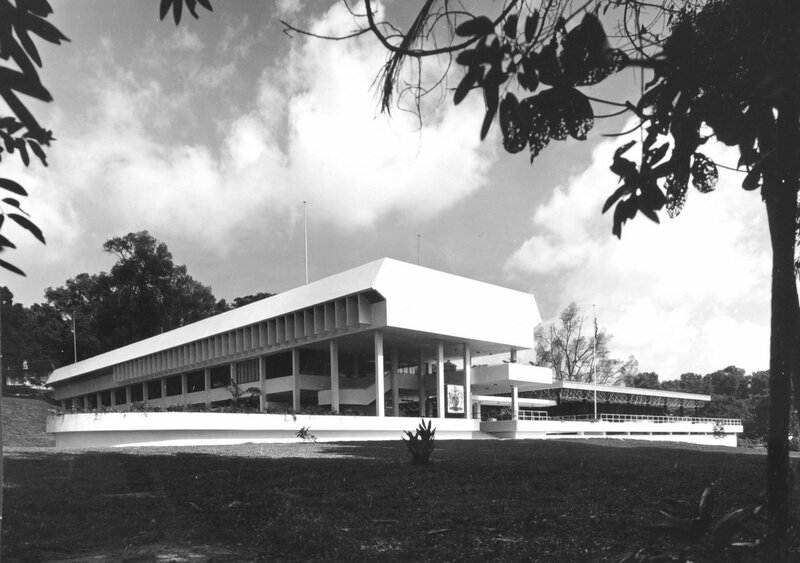 A semi-permanent external pavilion, with raised floor and canopy, was built adjacent to the east front in 1972 for large receptions but dismantled about ten years later. Despite intermittent suggestions that it was too large, too grand or too expensive to run, Eden Hall remains the residence. It is listed locally as being of architectural and historic merit. About a hectare of the west side of the site was sold for about £20 million in 2002. Main. south, front of Eden Hall, with short-lived canopy at right, 1973. Residence, from the south-east, 1970. The 1971 Exchange of Notes between the British and Singapore governments, which regulated the withdrawal of Britain’s forces, far-sightedly included reference to forty-four quarters in the Medway Park Married Quarter Estate being made available free of charge to the high commission for as long as required. The eventual quarters selected were in fact seven for senior staff at Ridley Park and thirty-seven at Medway Park for other staff. This amicable and cost-effective solution to the high commission’s long term housing needs worked exceptionally well. 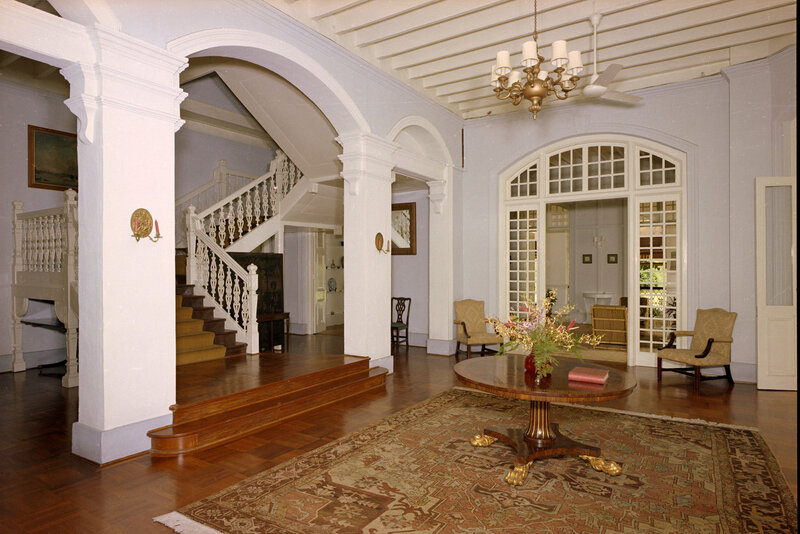 In recent years, some of the houses have been handed back as the high commission’s staff has reduced. Braddell Rise and Holland Road were disposed of after Medway Park was occupied in 1973. Several larger houses were acquired in the late-1940s and early- 1950s, including 170 Swiss Club Road, 86 Fernhill Close, 23 Mount Rosie Road, 16 Queen Astrid Park, and 15 Swiss Club Road. In 1964, a recently built house, called Ladyvale, next to Eden Hall was bought for the deputy high commissioner, at a cost of £53,000. With the exception of Eden Hall and Ladyvale, all these houses were sold for good prices during the 1980s.